You guys should be experts at this point. Mix everything in a bowl, use your fingers and mix together - take care to make sure everything is well blended. 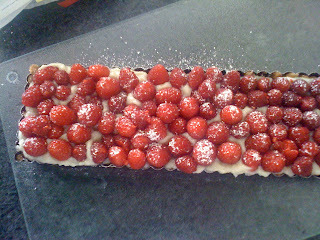 Butter spray a pan - I used rectangle this time because I was taking the tart to a party and wanted a fun size, but anything works. Put the dough into the pan and press it out. Cover with plastic wrap and put in the fridge for at least 45 minutes. Pre-heat the oven to 350 degrees F. Bake for 20 minutes until a it's a nice golden brown. Pull out and let cool. I'm not sure if this is "the way" to make syrup. I wanted less sugar and I clearly made far too much so I just put the rest in a jar for another time (I'm sure you'll use it, it's tasty!). I took the hibiscus flowers which I got at Trader Joe's (http://www.traderjoes.com/) for like $2, no joke. I have tons left over, which you can use in the bottle of a glass of champagne, or just eat on their own, delicious. I put these flowers in a small bowl and covered them with boiling water. I was tired so I just left it like that overnight, but I'm sure you could get away with about 45 minutes of steeping. I then put the mixture into a pot on the stove and brought it to a light boil. I added the sugar and let it sit there while I went about my business for awhile. Then I came back when it had reduced a bit, took the flowers out, and sieve it into a jar. I reserved about 1/4 cup. Ok gang - cornstarch is awesome. Check this out. I put the milk in a pot and let it come to a light simmer on the stove (about 5 minutes on low-medium heat). I added the egg yolks (and had the egg whites for breakfast this morning! yummy! ), the sugar, salt, and cornstarch. It instantly became a beautiful light yellow custardy mixture. I took it off the stove - DON'T let it scorch! The second it thickens, you're done! And don't forget that the pot is still hot, so get that mixture out of the pot as soon as you can. Put it in a bowl, cover with plastic wrap and push the wrap right into the custard so that you don't get a skin on it. Leave it in the fridge for at least an hour. Take the mixture out of the fridge, add the vanilla and hibiscus syrup. Put that in the base of the crust and top with raspberries. Dust with confectioner's sugar if desired. This is my favourite so far---- it looks AMAZING! I am in love with berries too. We should get married. Eat lots of berries. .